I always think we get tough draws. Quite a few Non league teams in there still, so we missed an easier draw. I'd have liked Cogenhoe United or Aylestone Park.....! This confused the hell out of me..... when is the FA Cup 1st round proper..... should be around the same date? Therefore when is the draw? Edit: Assume the draw will be w/c 22nd Oct, given the below; Look at some of the former League sides in that. Sends a shiver down my spine. The fourth round qualifying is scheduled for the weekend of Saturday 20 October. Each winning club will receive £25,000 from The FA prize fund and a place in the first round proper. I reckon nine northern ex league clubs in there and five Southern. I wonder if that is significant. Statistically not..... but I take your point. Does it point to a North/South divide in terms of spending power. It'd be interesting to see if - of the 92 league clubs - there has been an increase in proportion of Southern teams since the inception of the Premier League. Sounds like one for @singe that? I've always assumed that the drawing power of London would tilt the balance at the top level eventually but the investment in City has rather skewed that. Quickest off topic ever....! ? As in the real FA cup, there are preliminary rounds, so too tricky to find out, think I'l give that one a miss, thanks all the same! To be honest, over that time scale there may be a variety of reasons teams may not enter for a season or more. 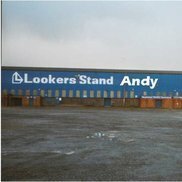 It's surprising, to me anyway, that there is still a ready supply of well backed small northern clubs giving it a crack. The likes of Fleetwood, Fylde, Salford all examples and I think there are others, Harrogate perhaps. Not so many down south that I can put in the same category. You misunderstand me.... 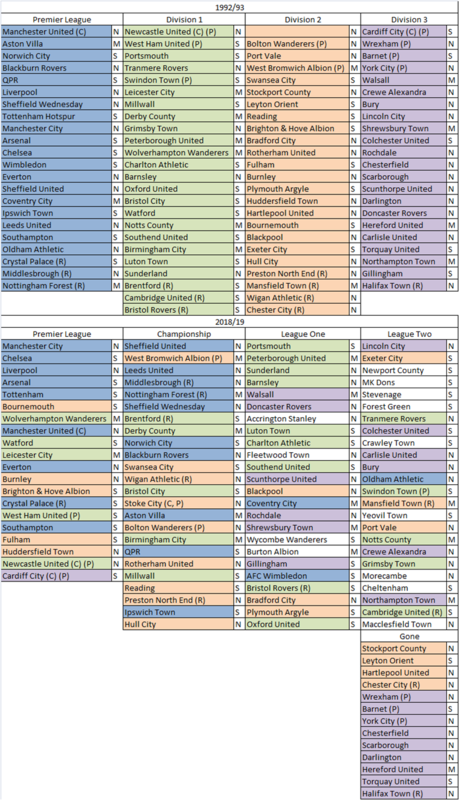 I'm talking about the make up of the 92 league clubs by year, from 1992 to the present day. Are there more Southern clubs higher up the pyramid now, than there were then? Balls to it.... There were 42 Northern Teams in the top 4 tiers in 92/93 vs 37 today. 35 vs 40 for the South and the Midlands is 15 all. 9 out of 13 Teams to have fallen out of the League in that time are Northern. The ratio of Premier League teams is now more Southern. 10 Northern 3 Midlands & 9 Southern in 92/93 vs 7 Northern, 2 Midland and 11 Southern today. It does indeed suggest a North/South divide influenced by money. Apologies, I see what you mean. Nicely done. Everton Hav done amazing to Hav never been religated since the prem began! Despite the fact they regularly get beaten by us Everton are a massive club. Anybody who remembers the 80s will remember they were one of the “big 5” well before Chelsea and Citeh got involved. Altrincham radio raving about 15yo Jack Williams and say Oldham have a future star on their hands. Let's hope the big clubs don't poach him. Just think, if he develops to his full potential he may have racked up fifteen minutes in the League Cup for City by the time he's 25. Or like one ex youth go on to play for England and be worth millions (not to us though). Excellent from the youth team with a good all round team performance and some good individual performances.The two wingers Robinson and Williams dominated and the defence stood up well. I think Jack Williams is going to go far in the game,I don't see how we can keep hold of him-his balance and control is superb. This youth team are well worth a viewing. We played with 2 wingers and scored 6 goals!..did you take note of that Frankie, it was how the team you played in shaped up and notched a few goals? No he hasn't taken notice. I've been told that he has not watched the youth team all season.They should send the whole first team to watch this lot,they may learn a lot.